Butternut noodles are a surprising thing – somehow the spiralizer totally changes the texture of butternut squash, leaving behind some of the squashy-ness and transcending into wonderfully sweet noodles! You’re going to love them with all sorts of toppings, but today I’m giving you my favorite pairing yet – Rosemary Chicken Ragu. The savory sauce has an almost velvety texture, rich with rosemary, and ultimately comforting. When you pair that with slightly caramelized butternut noodles you have the perfect match. And… if you’re like me, you’ll gild the lily a bit by adding a sprinkling of freshly grated parmesan! 1) You can only spiralize the straight, solid part of the squash – the rounded end with the seeds needs to be cut off. After you peel it, you need to cut the squash in 4″ lengths or so. If you try to spiralize the whole piece the weight of the squash really gets in the way and ruins your leveraging ability. And speaking of cutting the squash into 4″ lengths, try to slice as straightly as possible for a nice flat surface. When you fit the squash onto the spiralizer, flat sides make your life so much easier. I like to roast butternut noodles – you can sauté as well but roasting is nice because the oven does all the work for you. Simply toss them with a bit of olive oil and season with sea salt before roasting. Veggie noodles are just like cooking pasta in that you need to season as you cook – it’s the secret to restaurant-like flavor! A well seasoned sauce cannot make up for bland noodles! And here they are, hot and steaming right out of the oven! I like to pull my noodles out while they’re still al dente and hold their shape, but feel free to cook them to whatever texture you prefer. 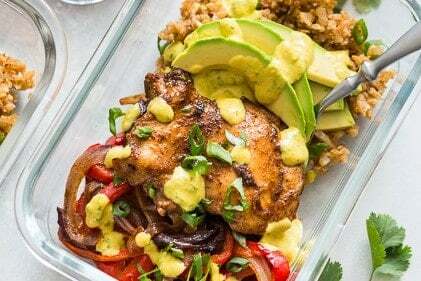 I developed this recipe to make twice the amount of sauce you’ll need for 1 meal because I love cooking once and eating twice! Simply freeze half of the sauce, and you’ll thank yourself later when you make dinner with your awesome pre-made sauce! But… if you want to use all the sauce right away, simply make twice the butternut noodles, and you’ll be good to go. As a final note, I always know a recipe is a hit when both Tyler and I want to eat it every-single-week! I’ve also been eating the leftovers cold, straight out of the fridge – so I think this one is more than here to stay! Note: You’ll need to double the amount of butternut noodles if you want to use all of the sauce. We like to make the sauce once and freeze half of it for another super easy meal! Start by heating a large deep sided skillet, or dutch oven over medium-high heat. 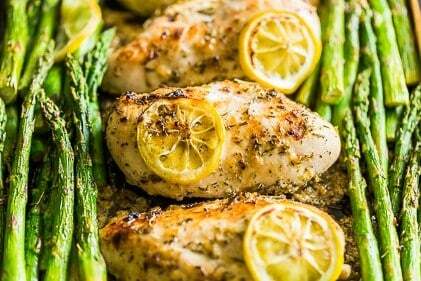 When the pan is hot, add 1 Tablespoon of the olive oil to the pan with the chicken. Brown the chicken, but don’t worry too much about cooking it all the way through, it will finish cooking in the sauce at the end. Remove the chicken from the pan and set it aside. Add the remaining 2 Tablespoons of olive oil to the pan and sauté the onion until translucent with browned edges. Add the garlic and rosemary to the pan, and sauté just until fragrant before adding the sea salt, chicken stock, and blended tomatoes. Bring the sauce to a boil, then reduce the heat until you have a gentle simmer. Simmer for 25 minutes or until the rosemary is no longer the prominent flavor of the sauce. Depending on your simmer, you may need to add a small amount of water if the sauce starts to get too thick. While the sauce is simmering, prepare the butternut squash by cutting off the stem end and the rounded end with all the seeds, (reserve the unused squash for another purpose – like roasted veggies). Peel the remaining squash, (you should have around 2 pounds remaining) and cut it into about 4″ lengths for spiralizing. Fit the squash onto the spiralizer (I used the 1/4″ blade) and spiralize. Peel apart any butternut noodles that are sticking together and place them on a parchment lined baking sheet. 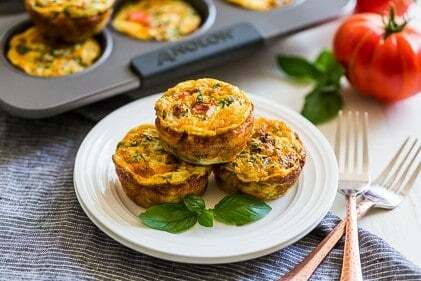 Drizzle them with a small amount of olive oil and sprinkle with ground sea salt. Toss the ‘noodles’ to thoroughly coat them. When the sauce has simmered for about 20 minutes, add the sautéed chicken and continue to simmer while you roast the ‘noodles’. Place the butternut noodles in the oven to roast. Roast until they’re al dente – about 8 minutes. While the butternut noodles are roasting, grate the optional parmesan cheese. Serve the noodles topped with the sauce, and a sprinkling of parmesan cheese if desired! Very tasty! Currently eating it right now. Question though, my sauce was more on the watery side, was I supposed to drain the extra sauce that surrounded the tomatoes in the can? So glad you enjoy them! You don’t drain out the water from the tomatoes, if the sauce is a bit watery, just simmer it until it’s the texture you desire before adding the chicken back in towards the final minutes of the cooking time. Canned tomatoes can really vary in water content, so the cooking time for my sauces is always based on how long it took my sauce to simmer, but it can vary as well depending on the heat of your stove’s burners as well. Just curious…what do you do with the part of the squash with the seeds that you did not use for noodles? After we’ve finished dinner, I cube up the part with seeds and add a few other root veggies and sliced onion to the mix. I place it all on a parchment lined sheet pan, drizzle with olive oil, sprinkle with sea salt, and roast the veggies at 425ºF until they’re tender and caramelized. From there I use the roasted veggies in everything from scrambled eggs, to soup, to Thai curries! Simply delicious. We call it butternut pumpkin here in Australia, but never thought of making noodles out of them. Roasting them was amazing too. Thanks for inspiring. Oh, and the ragu was awesome too. I’m so glad you enjoyed it! I really love the flavor of butternut when you roast it, somehow it seems to taste less squash-y and more caramelized! Rosemary is the best! 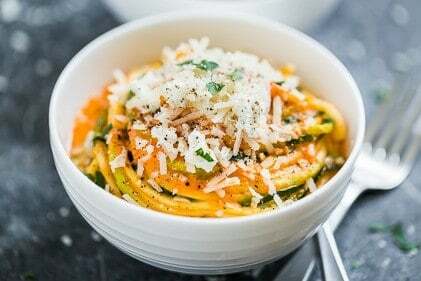 I love your butternut noodles (time to get that spiralizer!) and I love how you used chicken thighs. Was just reading that Chipotle uses chicken thighs because they just don’t get as dry as chicken breasts. Besides, my mom says it’s time to get over my fear of chicken thighs! Rosemary is the best isn’t it, and once you start using chicken thighs you may never look back! I’ve never made bolognese sauce with chicken and I’ve never made butternut noodles. I guess I need to fill that void pronto with this recipe! You’ll absolutely love butternut noodles – they’re a great change of pace from the way I usually just cube up and roast it!